This article brings together various sources and partial translations of articles published on various websites. The author wants to give a general introduction to topics that, especially in the case of the MUOS (Mobile User Objective System, a military telecommunication system of the US Navy) are not of importance in public opinion because it is only marginally covered by the media. Nevertheless, what is happening in a small community of 30,000 people located in a marginal area of the current geopolitical scenario can significantly alter the future of the Mediterranean Sea and its peoples. The issue of the MUOS is central to NATO’s military interference in all countries “allied” to the United States. MUOS is a means of territorial expropriation that transposes the role of communities – “guilty” of living in these areas – for utilitarian purposes only. AGS is a NATO system that increases the UAV (drone) presence in the Mediterranean. It consists of five new Global Hawk drones controlled from the Sigonella (CT) Main Operative Base (MOB) in Sicily. This base provides data link connectivity, data processing and exploitation capabilities, and interfaces for inter-operability with command, control, intelligence, surveillance and reconnaissance systems1. NATO declared openly that: AGS will be able to observe what is happening on the earth’s surface, providing situational awareness before, during, and, if needed, after NATO operations. Global Hawks are the ultimate in surveillance technology from a very high altitude, drones with large operational autonomy and advanced data transmission capacity. The decision has been made that Sigonella will be the main drone operative centre in the Mediterranean. We can expect, therefore, an increase in the use of its facilities in war/crisis when AGS is operational in 2017-2018, the expected date according to the NATO website. Sigonella has transformed its operational mainlines over the years. Originally, from 1959, it was a logistic hub of the US Navy. It has increased in importance since the Cold War ended with the subsequent growth of American interests in the Mediterranean area2. During the “Arab Spring”, the US, hidden in the clothes of NATO, demanded a reinforcement of the base with other recognition aircraft. The civil airport of Birgi, located in the very west of Sicily, was used by French, Italians (sustaining its most important air bombardment operations since WWII) and Canadians to bomb Gaddafi’s Libya. Sigonella is now integrated into a major program of economic investment by the US Navy regarding another obscure project of global surveillance, the Mobile User Objective System (MUOS). The MUOS is a military telecommunication system of the US Navy. A constellation of five satellites will cover the whole world, and ground communication is serviced by four stations. 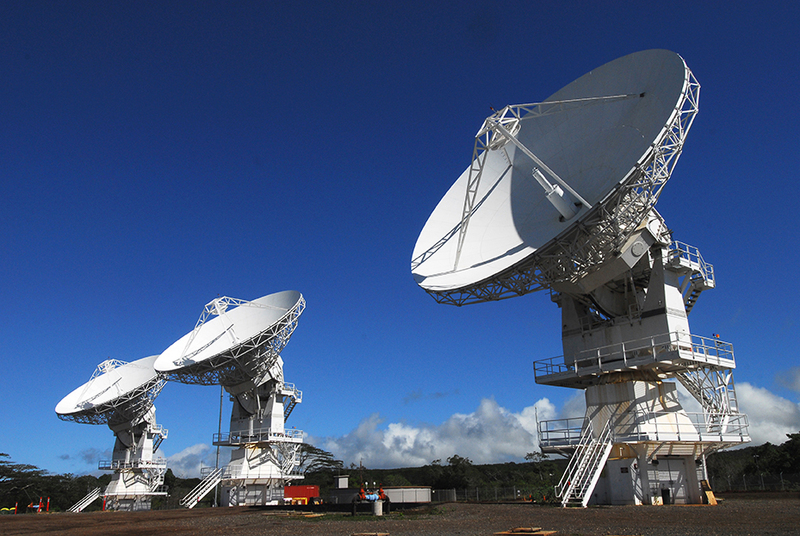 Each ground station hosts three parabolic antennas, about 18.4 metres wide, and two elicoidal antennas about 149 metres high. The MUOS will be used (when completely operable) to coordinate and command all US military systems around the world, especially drones. The project started in 2004 with the contract given to the infamous Lockheed Martin (for 4 and then 5 satellites). Further international consultations with partner nations defined the locations of the four ground stations. The Australian station location was designated in 2007 in an area 30 km away from the first inhabited centre that was already used by NSA and ASD (Australian Signal Directorate) to intercept communications from Russian, Chinese, Japanese, Indian and Pakistani regional satellites and international communications satellites, throughout the Indian Ocean and South-East regions 3. The installation in Niscemi, Italy is located 5 km from the small town, and 21 km from the next civil airport (Comiso). It is a similar situation for the station at Wahiawa, Hawaii. The first earthmoving work and preparation of platforms for the installation of the station started in 2008 while a final opinion of clearance was still waiting to be forwarded to the US Navy. Here begins something that could seem normal to a person following the affair from an external point of observation, not for a sicilian. The inhabitants started to realize how easily their territory had been sold even at the expense of landscape and natural restrictions inviolable by law. On 28 february 2009 students of the local council demonstrated for the first time against MUOS 10. The same day the Sicilian Region asked US Navy technical characteristics of the project. They cannot be convinced to reveal such data. The reason soon became clear, perhaps, by the presence of a dark character of Italian politics. In fact in 2010 the infamous Ignazio La Russa12 sat in the chair of Minister of Defense. Said and done. An “independent” commission of experts of the University of Palermo appointed by the Sicily Region gave a favorable opinion to the installation of the MUOS station in Niscemi. The existence of two contracts, for a total value of 70,000 euro, awarded by the Faculty of Engineering of the University of Palermo and the Research Laboratory of the US Army – Department of Defense, raised doubts about the independence of the experts. What follows was a sequence of attempts to suspend the work by the Niscemi town throughout the year 2011. Meanwhile, Lockheed Martin announced the successful launch of the first two satellites in the first half of 2012.
for suspected crimes against the environment. The following day (6 October 2012), 5,000 protesters marched from Niscemi and other nearby cities to the NRTF-8 station. However, the confiscation of the construction area granted for the MUOS did not last more than one month. In fact, the “Tribunale della Libertà” (court of appeals) of Catania gave the site back to the Ministry of Defense. The US did not hesitate and started immediately sending material and manpower to Niscemi to complete the installation work as soon as possible. Perhaps they were even aware of the irregularity of the work plan. This was when the vicissitudes of the “Presidio”, a community group of local citizens13 who control the main access roads to the station NRTF-8 became involved, which was countered by the police and the US military. This No MUOS activity was also hindered by a double agent game of the Sicilian institutions which were making populist declarations against the MUOS but were not able to produce any official act to block the previously given authorisations. On 7 January, a few hours after the discussion of the ARS about the MUOS, the Minister of the Interior, Annamaria Cancellieri, sent a note to the President of the Sicilian Region, Rosario Crocetta, stating that the MUOS was “of interest strategically for the military defense of the nation and our allies.” The National Government stated that “there will be no tolerance for behaviors that block the implementation of the requirements of national defense.” This was a clear threat to the activists that were protesting at the entrances to the US base at Ulmo by the end of November. This was not a casual statement, given the fact that hundreds of riot police permitted the movement of the crane from the Comina Srl. firm to a position at the NRTF-8 station. This happened after authoritarian pressure by Mario Monti14, which was followed by a note sent to the ARS President and to the Sicilian President Crocetta. However, these government actions did not calm or diminish the continued protests. Instead, this was the beginning of a series of revocations of authorisations from the various regional organs, which were sent to the US command in Naples and brought in person to Sigonella. However, the regional officer was rejected and the package was not accepted. The US consulate immediately contacted the region for clarification. Simultaneously, a long note appeared on the official website of the consulate that attempted to disprove one by one the reasons for the protests of the activists. No mention was made in regard to studies conducted by local citizens, and instead only imaginary studies were referenced that supposedly demonstrated the absolute safety of the system. The US consul ensured that the construction work was suspended pending clarification with the local population. Activists at the Presidio kept on blocking soldiers and workers. On 29 March, the Regional Department for the Environment and Territory signed the definitive revocation of permits for the construction of MUOS. The decision arose in response to a large demonstration organized by the movement No MUOS, where more than 10,000 people marched up to the base NRTF-8. However, this revocation did not stop the US’ desire to complete the work. Workers were disguised as military personnel and were passed through the blocks of the activists. This tactic was also documented by video footage of television crews15. Even Anonymous published data referring to activities to circumvent the revocation. This data referenced officers of the Italian state, who reiterated their willingness to ensure the project’s success for its “ally”. Then, a succession of appeals began in courts. However, the US military still had more and more workers infiltrate the base, who made progress putting in place the parabolas in the first half of 2013. While various reports confirmed the inaccuracy of the analysis conducted by USA and by the ARPA technicians, the revocation of the work authorisation was suspended by the Sicilian President Crocetta16. This surprising decision was made in accordance with the I.S.S. report that excluded health hazards. This relation took into account data produced by the US, which was not particularly detailed. Furthermore, the National Government allowed a one-year permission extension of the work authorization, effectively allowing the installation of the MUOS in Niscemi. The permission was granted because of a decree introduced during a period of strong internal crisis, the so-called “Decree of doing”, legge Bosetti e Gatti. This act introduced many technicalities sponsored as a way to revive the local economy, but it effectively gave more opportunities for economic speculation. All of the crisis governments that followed Berlusconi – Monti, Letta and now Renzi – are the principal reason for the successful realisation of work at the NRTF station. In January 2014, the parabolas were positioned at the base17. Although many procedures were clearly in violation of Italian law, the response of politicians, in a political scene confused by the crisis, appeared to be ambiguous and unclear. There were many motions that opposed the bilateral agreement between Italy and the US, but none were accepted by the Senate. However, the response of the Italian justice system was clear. The T.A.R. pronounced a verdict against the MUOS after a further extension of the report conducted by Marcello D’Amore at the end of 201418. The updated report estimated the risks to the nearby airport of Comiso and verified the reliability of the I.S.S. report. In September 2015, the station was again confiscated by the Prosecutor of Caltagirone (CT), but the Ministry of Defense was against the decision and waited for yet another verdict from the Consiglio di Giustizia Amministrativa (CGA). The sentence from 3 September, one day after the launch of the fourth satellite, created a “Board of verification” with five members: three nominated by the Ministries of Health, Infrastructure and Environment, plus an appointed member of the National Research Council (CNR) and a member of the National University Council (CUN) 19. This Board should expose to the public a final study of the effective dangers of the MUOS to public health, as well as possible aircraft interference from nearby airports of Catania and Comiso. Another alarming decision of the CGA forced the Municipality of Niscemi to pay on its own expense the technical costs for verification. This situation is not optimal for a town that is still paying for years of bad administration (like many municipalities in the south). Sebastian Papandrea and Paola Ottaviano, lawyers for the regional coordination of the NoMUOS committees, commented on the judgment of the CGA that, “The sentence moves on a political level rather than a legal one, and treads once again on the rights of the people who are always subject to the stronger interests and logic of war.” Several No MUOS activists cut through meters of fence at the base in response to this decision. They explained that the fight was not over, and that they relied on the solidarity of other resistance movements against capitalist speculation around the peninsula. It is clear that the majority of the board of three members of the current government appears as a partial victory for the USA. This is a government that has always had a positive opinion about the installation yet it reiterated that centralized state power abused the Italian southern peripheries, where places were turned into military facilities or dumps for Northern industries20. The US has been clear about its wishes to have the work continue. But the US has also looked around for other potential sites where they could reinstall the station. However, Italy is the only really friendly (or subservient) nation in the area that ensures internal stability. The region is characterized by the strong presence of US/NATO facilities with military bases offering important logistic support21. It is therefore expected, as the American consul Barrosse stated, that the US will try all possibilities and legal technicalities to make sure the station is opened22. A notice for a possible relocation of the station to Tunisia in the Mediterranean area was recently denied by the local government, because it was deemed impossible for constitutional reasons to host foreign bases on its territory. Over the years, No MUOS has been the main protagonist of resistance against the MUOS. The whole series of obstacles they created against this imperialist project was only thanks to their tenacity. They challenged the usual inaction of the political institutions of the south. Particularly memorable were the activists’ raids on the site in 2013 and 2014, in which thousands of people were able to enter into the base by climbing over fences, and then they hoisted flags of protest on the antennas23. The pacifist artist Turi Vaccaro was also able to get into the base for what could be described as “Poetic Terrorism”24, during which he mocked the most advanced surveillance system in the world “armed” with geranium seeds, a flute and protest letters25. “The No MUOS movement aggregates people mostly from Sicily who share an idea of progress based on the development of territory, rather than its debasement into making facilities for war. We are citizens who believe in a central role for Sicily in a Mediterranean of peace. Our objective is the revocation of the authorisations that allowed the building and activation of the MUOS station in Niscemi, Sicily. We pursue this objective at the political level, in courtrooms, in workshops, and in the street. We act at different levels: safeguarding the ecosystem of the Sughereta park, protecting the health of Sicilian citizens with independent monitoring of radiation, information campaigns and petitions, political lobbying, and legal actions. We are people who feel strong responsibility towards our fellow citizens who, freely and with enthusiasm, joined our cause. Hence, we feel obliged to be free from political influence. This experience gathers together the Movimento No MUOS Sicilia, a legally recognised association, the committees of the well-known No MUOS Mothers, anti-mafia associations, and cultural groups” 26. The realization of MUOS related to the AGS demonstrates the increasingly oppressive US military presence in the Mediterranean. This presence should make us think about the US’ imperialist plans in the coming years27. With the expected completion of these two projects in 2017, the United States will be able to engage in extensive military trials at levels not seen since the Cold War. “Trident Juncture 2015 will demonstrate NATO’s new increased level of ambition in joint modern warfare and will showcase a capable, forward leading Alliance equipped with the appropriate capability and capacity to meet present and future security challenges” 28. From October 3 to November 6, 2015, about 36,000 NATO soldiers have conducted the Trident Juncture military exercises in the Mediterranean Sea and in the territories of Italy, Spain and Portugal. The stated aim was to pursue more efficiency for an invasion of an area within a short period. This military effort was an obvious burden on the civilian population. In Trapani, Sicily, the civil airport of Birgi suffered more interference from the NATO air force (as it did from the Libyan crisis of 2011)29. Many protests have occurred in Sardinia against the military training taking place at the base of Decimomannu30. Some sources have mentioned that these protests are the main reasons why NATO has moved its operations in Sicily. We should not forget, however, that the choice of Trapani as the hub for air operations is also strategic, and was not just related to tensions with the Sardinian population. TJ15 was preceded by another large scale operation called “Swift Response”, the largest training of NATO airborne forces since the end of the Cold War with about five thousand men31. These events increasingly outline a scenario where regional crises are not solved despite the West’s continual claims to bring stability to occupied countries. Other crisis areas are ready to burst from day to day. The US strategy seeks to enforce its hegemony quickly in order to resolve such crises, and then exploits territories through typical capitalist “reconstruction”. Afghanistan – 14 years of occupation – Iraq – 12 years – and now, Syria – tells us a different story. Nevertheless, the presence of NATO in East Europe is increasing as demonstrated by the military war games “Allied Shield”, “Trident Just” and “Noble Jump” in 2015. These showdowns are used to offset the partial revival of Russian claims in 2014. Meanwhile, kids are taught to defend their nation in Ukraine by wearing t-shirts with a stylized Black Sun – heritage of Nazi symbolism – straight backwards to the future – 1933 32. Arturo Parisi was the Ministry of Defense during one of the most ridiculous parts of Italian political history in the last years. After winning the election in May 2006, the Italian Prime Minister Romano Prodi (Partito Democratico) agreed to govern despite a chaotic situation in the Senate. (His majority was just 165 against 155 opposed). It is also important to define the internal conditions in Italy in relation to this delicate international military agreement. The Prodi government fell just two years later, after an indictment for a concussion against his justice minister(! ), Clemente Mastella. Prodi is succeeded by the fourth, and last, Berlusconi government (which is no less ridiculous). The other airport connected to this is the far more important hub of Catania, about 70 km away, which is the principal connection with Sicily. Public entity which protects forests and natural areas in Italy. Referred to the existing operative NRTF 8 station. The No MUOS movement was founded by local residents of Niscemi (CL) and started to grow in the same year. In “Area A” zones it is forbidden to develop buildings, power lines, aqueducts, telephone lines or technological systems network. A militant of MSI, Movimento Sociale Italiano, during the “Anni di Piombo” between 1970 and 1980. This group is known for its reactionary and extreme right wing positions. He was accused, in 1973, of being morally responsible for the launch of two hand grenades during a manifestation of MSI in Milan. A policeman was one of those killed. Different from the battle against the Cruise missiles in Comiso of 1987, the protest is now lead by the local movement of No MUOS, and representatives of No Tav, No DalMolin, No Ponte, and Movimento5Stelle were also invited and present to the demonstrations. This was good news for a territory characterized by low resistance to abuses of power whether it was the illegal mafia, legal mafia or international interference. Mario Monti was called by the President of the Italian Republic to substitute for the resigning VI Berlusconi government in 2011. Giampaolo Di Paola stood out as a presence in the new government, and he was previously the president of the Military Committee of NATO. He became the Minister of Defense in the key period of the struggle against the installation of MUOS. The proof of his loyalty to the US dates back to June 24, 2002, when, as the national director of armaments, he signed at the Pentagon an agreement that committed Italy to participation in the F-35 program, and the purchase of 131 military aircrafts for about 8.5 billion dollars (2002 currency prices). A documentation of all the inequalities of the Italian state relating to its territory might be longer than this specific article. The reader can look into research about the US’s military presence in Sicily after WWII, the militarisation of Sardinia, and the dumping of dangerous industrial waste in Campania. Evidence of this includes the establishment of AFRICOM in 2008, the general command for US military operations in Africa. The island was subjected to the controversial presence of depleted uranium in military areas. At the same time this was in progress in the United States, “Jade Helm 15” training was designated by the US special forces. This generated protests about its real purpose. One may think that the Federal government wants to make the presence of soldiers in the streets “normal”, and that it was a prelude to more oppressive measures like martial law in the event of serious internal crises (especially economic ones). News of these supposed actions are continuous, and a confrontation between reality and fiction is lost. In all of this, overly excited conspiracy theorists barricade themselves inside waiting for yet another, never transpiring worldwide catastrophe. Unknown to most Americans, the US government is channeling financial support, weapons and training to a neo-Nazi entity, which is part of the Ukraine National Guard, the Azov Battalion.